Continental flood basalts (CFB) are huge magmatic events that are particularly abundant during the Phanerozoic (for a review, see Courtillot & Renne, 2001). Most of them are linked to the Pangea mega-continent fragmentation (e.g., the Central Atlantic, Parana-Etendeka, Deccan), and are characterized by giant dyke swarms emplaced in a radial pattern (e.g., Ernst et al., 1995; Ed: see also CAMP, Parana and Deccan pages). Dyke swarms are significant in part because their geometries are generally considered to be paleo-stress and -strain markers and as such they are useful for recognizing proposed mantle plume impact sites (Ernst & Buchan, 1997; Ed: see also Giant dikes pages]. However, dyke swarms are also known to be plate discontinuity markers (Fahrig er al., 1986) and more recent investigations support the preponderant role played by the pre-existing structure of the lithosphere in controlling dyke-swarm emplacement (Mège & Korme, 2003; Trumbull et al., 2004; Jourdan et al., 2004) and/or CFB-related rift settings (Courtillot et al., 1999; Tommasi & Vauchez, 2001). Consequently, dyke distributions may not reflect a “primary” structural signature (i.e. a mantle plume impact) but could highlight preexisting lithospheric weaknesses. Nevertheless, few studies have focused on this issue, and the possible influence of various basement structures (e.g., the edges of cratons, mobile belts, shear zones, older dyke swarms) on CFB emplacement is still poorly constrained. Here, we summarize our work on the radiating dyke swarms of the Karoo large igneous province. The results are derived mainly from papers by Le Gall et al. (2002; 2005) and Jourdan et al. (2004; 2005; 2006). the field and petrographic evidence contained in published geological maps suggests that some of the dykes are pre-Karoo (Marsh, 2002). One of the best tests to discriminate between new and inherited dyke orientations is to detect Precambrian dykes in the Jurassic swarms. Accordingly, we efficiently distinguished between Jurassic and Precambrian dykes using abbreviated, low resolution, 40Ar/39Ar incremental heating schedules (the “speedy step-heating” technique). Figure 1: Location of the Karoo traps and regional dyke swarms; dykes are based mostly on aeromagnetic data and follow the compilation of Chavez Gomez (2001), modified by Jourdan et al. (2004). ODS: Okavango; ORDS: Olifants River; SLDS: Save-Limpopo; LDS: Lebombo dyke swarms. Dotted line corresponds to Botswana border. The Kaapvaal and Zimbabwe cratons and Limpopo mobile belt are indicated. Mozamb. = Mozambique. Inset represents schematic map of the dyke swarms. Click here or on figure for enlargement. 40Ar/39Ar “speedy” (Figure 2) and high-resolution dating performed on dykes intruding either basement or Karoo sequences, show that the Okavango dyke swarm includes both Proterozoic (850-1700 Ma; n=8) and Jurassic (179 ± 1 Ma; n=33) dykes (Figure 2). We obtained similar results for the Save-Limpopo swarm that also includes both Proterozoic (700-1700 Ma; n=14) and Jurassic dykes (~179 Ma; n=8; Figure 2a). 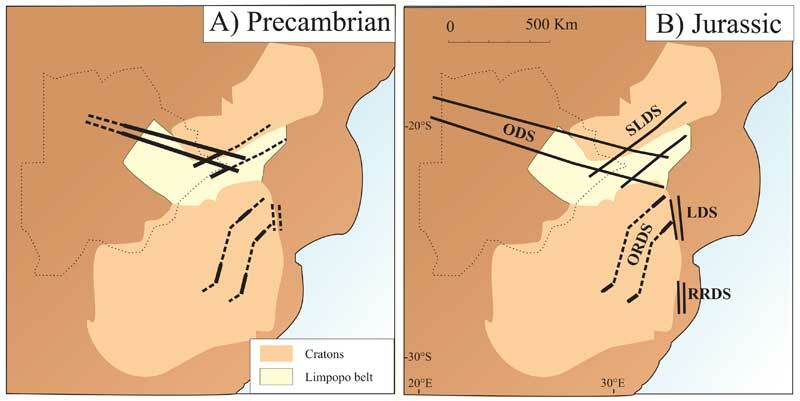 In addition, detailed field observations (Figure 1; see zoomed areas in Jourdan et al., 2006) show evidence of basement influence via the discernable rotation of these two swarms contiguous with the Limpopo mobile belt architecture. Figure 2: “Speedy step-heating” ages for the Okavango (ODS; red dots) the Save-Limpopo (SLDS; orange diamonds), and the Olifants River (ORDS; green dots) dyke swarms. Note also the correlation between age (i.e. Proterozoic or Jurassic) and the Ti-chemistry of the dykes. These dates are low-resolution and should only be used to differentiate between Jurassic, Proterozoic and possibly Archaean dykes. Click here or on figure for enlargement. The Olifants River swarm was investigated in its southern and northern regions. The ages obtained seem to indicate two distinct Precambrian dyke events, ranging from 850 to 1700 Ma and from 2500 to 2900 Ma. No ages consistent with the Karoo event were obtained, although scarce Karoo dykes are probably present in the Olifants River swarm. The Olifants River dyke swarm can no longer be considered as a Karoo-aged dyke swarm, confirming field observations previously mentioned by Marsh (2002). The last major branch of the Karoo radiating swarm studied is the N-S Lebombo dyke swarm which also includes the Rooi Rand dyke swarm (e.g., Watkeys, 2002). Unfortunately, because the number of outcropping dykes crosscutting the basement is low, it is difficult to test the effect of inheritance in this dyke swarm. Nevertheless, some N-S striking dykes intrude the basement on the west side of the Lebombo monocline and three of them have been dated between 1200 and 1650 Ma. Broad-scale observations show that the so-called “triple junction” is a more complicated structure than portrayed in some oversimplified sketch maps. First, the Okavango and Save-Limpopo dyke swarms, though both of Karoo age (~179 Ma; Le Gall et al., 2002; Jourdan et al. 2004; 2005 and unpublished data) and referred to as a radiating, do not radiate from Mwenezi area, but rather consist of two crosscutting swarms (Wilson et al., 1990; Ernst & Buchan, 1997; Figures 1 & 3) which partially overlap in the Tuli basin area (Figure 1). Secondly the Olifants River swarm does not converge near Mwenezi but actually stops against the Lebombo monocline hundreds of kilometers to the south (Figures 1 & 3). Figure 3: Sketch maps of the four radiating dyke swarms based on 40Ar/39Ar ages, aeromagnetic data, and field observations. Solid lines correspond to segments of the swarms in which measurements and observations have been made; dashed lines represent inferred dyke swarm extensions. Densities of dykes within the swarms are not shown. Plots show the diachronous intrusion of dykes making up each swarm; dykes intruded prior to the Karoo volcanism (A), and almost contemporaneously with the ~180 Ma Karoo CFB (B). Click here or on figure for enlargement. a branch (the Save-Limpopo) which does not really radiate from the (Mwenezi area) focal point. Therefore, the apparent radiating structure is not sufficient to infer the existence of a Jurassic mantle plume impact, because Proterozoic dykes, which cannot be related to a plume impact in Karoo time, define a similar pattern (Figure 3). It is therefore likely that during Jurassic magmatism, basement structures acted to control the orientation of Karoo dykes. Thus, the Karoo dyke swarm geometry should no longer be used to support the Karoo mantle plume hypothesis; nevertheless, a mantle plume origin for Karoo magmatism is not ruled out. Additional 40Ar/39Ar age data (Jourdan et al., 2005) demonstrate that the Karoo province was a relatively long lasting event, including brief specific magmatic events (e.g., Okavango dyke swarm). Time-space emplacement of the Karoo basalts potentially suggests an origin different from that of postulated plume-related continental flood basalts such as the Deccan or the Ethiopian-Yemen traps, for which emplacement duration as short as ~1 Myr (Hofmann et al., 2000) or ~1.5 Myr (Hofmann et al., 1997), respectively, has been advocated. Such a long duration is more in accordance with the time-span calculated by Turner et al. (1996) for flood basalts produced by the melting of a thick (>100 km thick) lithospheric mantle. In this section, we show that structural inheritance might have played a significant role during the emplacement of the largest Proterozoic and Phanerozoic (Gondwana related) flood basalt dyke swarms. The Mackenzie dyke swarm (northwestern Canada), the largest radiating dyke swarm on Earth, yielded U-Pb baddeleyite ages of 1267 ± 2 Ma (Le Cheminant et al., 1989; 1991) and is coeval with the Coppermine flood basalts and the ultramafic Muskox intrusion (Ernst et al., 1995). This NW-trending dyke swarm is flanked by a minor and younger NW-trending Franklin dyke swarm dated by U-Pb zircon/baddeleyite at 723 +4/–2 Ma (Heaman et al., 1992). Although the Franklin dyke swarm flanks the east of the Mackenzie swarm, the parallelism of these two dyke swarms has been controlled by a single crustal weak zone (Ernst et al., 1995). Buchan et al. (1993) reported geographically superposed dyke populations in southern Canada yielding U-Pb baddeleyite ages of 2210 Ma (the Senneterre dyke swarm), 2167 Ma (the Biscotasing dyke swarm) and 1140 Ma (the Abitibi dyke swarm). These two examples illustrate that dyke swarm inheritance might have played an important role in some Precambrian dyke swarms. Here we provide a brief overview of the relations between selected major dyke swarms associated with Gondwana break-up (Figure 4) and their basement structures. Figure 4: Schematic map of part of the Gondwana continent before drifting (modified after Schmitt et al., 2004) with superimposed CFB-related Phanerozoic dyke swarms of various ages (see text for references; the full extents of the CFB are not represented). Cratonic Proterozoic blocks as well as Pan-African / Braziliano, and Paleo-Proterozoic Limpopo and Central Indian (Zhao et al., 2004) mobile belts are shown. Click here or on figure for enlargement. Most dykes located on the circum-Central Atlantic continents are related to the ~200 Ma Central Atlantic Magmatic Province (e.g., Marzoli et al., 1999; Ed: See also CAMP and Giant dikes pages). Among these dykes, considered to converge towards a focal zone around Florida (May, 1971), one of the best defined swarms consists of WNW-ESE dykes in Liberia and their counterparts in French Guyana. The trend of these swarms follows the Pan-African belt separating the West African and Amazonian cratons. The South Atlantic opening was preceded by intense magmatic activity at ~130 Ma forming the Parana-Etendeka CFB associated with several major dyke swarms (Peate, 1997; Ed: See also Parana page). Among them, the most striking feature is the triple junction formed by the Rio de Janeiro, Florianôpolis and Ponta-Grossa dyke swarms in Brazil (Renne et al., 1996; Deckart et al., 1998). The two first branches apparently follow the Pan-African Ribiera and Kaoko belt directions and the third branch follows the Paleozoic Ponta Grossa arch (Chang et al., 1992). To the north, the Rio-Cerà-Mirim dyke swarm (Archanjo et al., 2000) is also Parana-related (Marzoli et al., 2000) and extends on the northern wedge of the Sao Francisco craton, in a direction parallel to the Pan-African Pernambuco (and its African counterpart) shear zones (Corsini et al., 1998) which may have controlled the swarm orientation. Another Parana-Etendeka related dyke swarm is the 100 km-wide Henties-Bay-Outjo dyke swarm in Namibia (Trumbull et al., 2004) which intrudes (and generally follows) the SW-NE oriented Damara mobile belt. Interestingly, the dykes fan out as they leave the Damara belt and intrude the Congo craton at the easternmost extremity of the swarm (Figure 4) (Trumbull et al., 2004). The gabbroic dyke swarm of the Red Sea rift paralleling the rift structure was emplaced between 24 and 21 Ma (Sebai et al., 1991). No basement structural control is apparent for the dyke orientations, but this swarm includes both Neogene and Proterozoic dykes (H. Bertrand. & G. Féraud, unpublished data), suggesting that the dyking event associated with the Red Sea opening followed an ancient Proterozoic direction. Finally we mention the radiating dyke swarm (e.g., Ernst et al., 1995) related to the 65 Ma (Hofmann et al., 2000) Deccan traps in India. One branch of the swarm intrudes and follows the Central Indian Tectonic Zone related to an Early Proterozoic collisional orogen between the southern and northern Indian blocks (Zhao et al., 2004; Ed: See also Deccan pages). The two other branches are parallel to the western edge of the Indian craton. 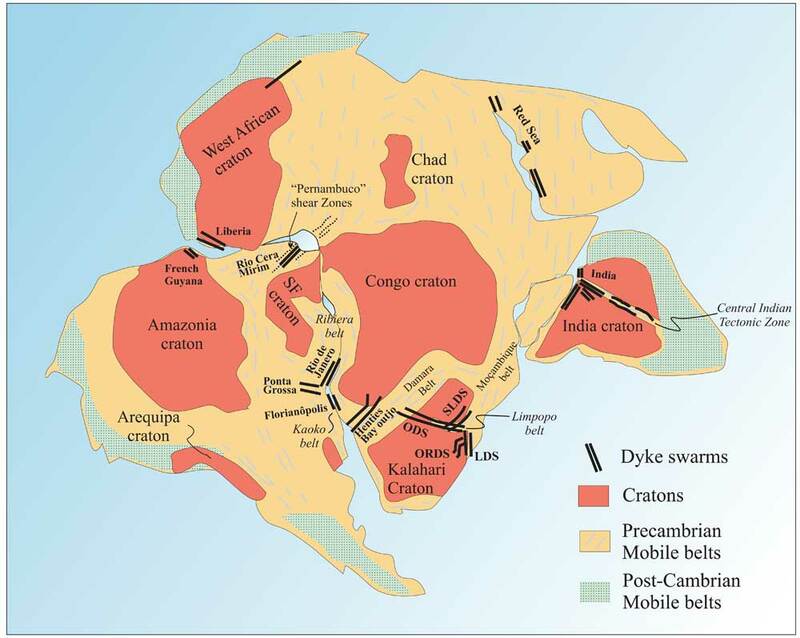 This brief overview shows that the most prominent dyke swarms related to Gondwana break-up (including those considered to define several triple junctions) mainly follow craton boundaries and are often parallel to mobile belts, shear zones and other pre-existing basement structures (Figure 4). The dykes were therefore possibly influenced by pre-existing structures with regard to both location and orientation, as we have shown in the Karoo case. Basement control of CFB-related dyke swarms therefore casts doubt on the “active role” of mantle plumes, if any, in causing the “triple junction” pattern marked by the occurrence of radiating dyke swarms. We suggest that a careful re-examination at field scale is required to better constrain the basement influence on giant dyke swarm emplacement. Basement structures play a dominant (but not exclusive) role in controlling the orientation of these major dyke swarms. The Precambrian Olifants River swarm is not of Karoo age contrary to previous speculations. The three major Karoo-age radiating dyke swarms unambiguously include Proterozoic dykes indicating a strong structural inheritance and precluding a newly formed Jurassic radiating structure. 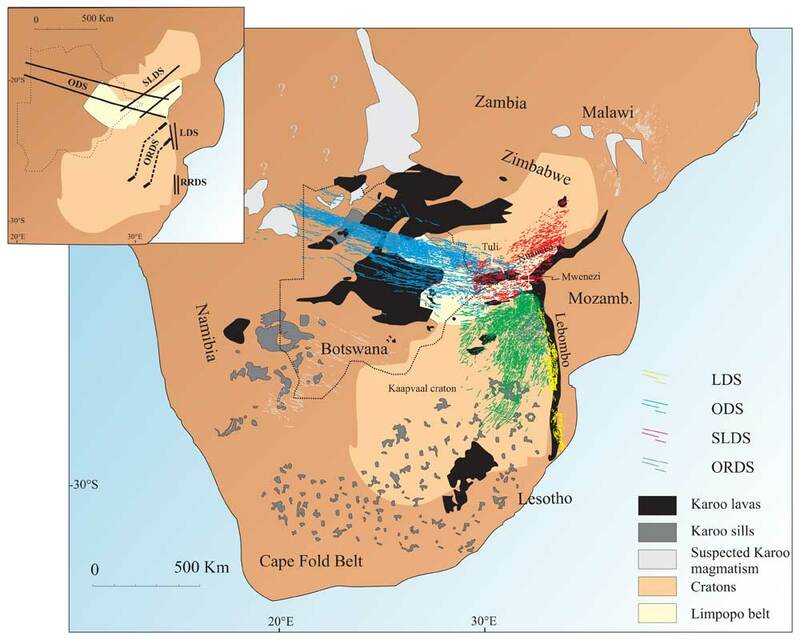 The apparent triple junction geometry was not induced by the arrival of a deep mantle plume head but is “inherited” from previous history of the Kaapvaal and Zimbabwe cratons. Therefore, this “triple junction” should no longer be used as an argument for demonstrating (although it does not exclude) the existence of a Karoo mantle plume. The “anomalously” long duration of the Karoo province (~8 Myr) is also relevant to the question of the existence of a mantle plume. Consideration of regional dyke swarms related to other Gondwana CFBs shows that they too generally follow pre-existing lithospheric structures such as craton boundaries, mobile belt orientations, basement fabrics and major shear zones. We conclude that the location and orientation of dyke swarms associated with Gondwana break-up were generally controlled by ancient basement structures and not by plume head impacts. Archanjo, C.J., Trindade, R.I, Macedo, J.W.P., Araujo, M.G. (2000) Magnetic fabric of a basaltic dyke swarm associated with Mesozoic rifting in northeastern Brazil. J. South Am. Earth Sci. 13, 179-189. Buchan, K.L., Mortense, J.K., Card, K.D., (1993) North-east-trending Early Proterozoic dykes of southern Superior Province: multiple episodes of emplacement recognized from integrated paleomagnetism and U-Pb geochronology, Can. J. Earth Sci. 30, 1286-1296. Chavez Gomez S. (2001) A catalogue of dykes from aeromagnetic surveys in eastern and southern Africa. ITC publication number 80. Corsini, M., Lambert de Figueiredo, L., Caby, R., Feraud, G., Ruffet, G., Vauchez, A. (1998) Thermal history of the Pan-African/Brasiliano Borborema Province of Northeast Brazil deduced from 40Ar/39Ar analysis. Tectonophysics 285, 103-117. Courtillot V., Jaupart, C., Manighetti, I., Tapponnier, P., Besse. J. (1999) On causal links between flood basalts and continental breakup. Earth Planet. Sci. Lett. 166, 177-195. Courtillot, V.E., Renne, P.R., (2003) On the ages of flood basalt events. C. R. Geosciences 335, 113-140. Ernst R.E., Head, J.W., Parfitt, E., Grosfils, E., Wilson., L. (1995) Giant radiating dyke swarms on Earth and Venus. Earth-Sci. Rev. 39, 1-58. Ernst R.E., Buchan, K.L., Palmer, H.C. (1995) Giant dyke swarms: characteristics, distribution and geotectonic applications. In Physics and Chemistry of Dykes (ed. A.H.G. Baer), pp. 3-21. Bakema Publication. Ernst R.E., Buchan, K.L. (2003) Recognizing mantle plumes in the geological record. An. Rev. Earth Planet. Sci. 31, 469-523. Fahrig, W.F., Christie, K.W., Chown, E.H., Janes, D., Machado, N. (1986) The tectonic significance of some basic dyke swarms in the Canadian Superior Province with special reference to the geochemistry and paleomagnetism of the Mistassini swarm, Quebec, Canada Can. J. Earth Sci. l.23, 238-253. Heaman, L.M. LeCheminant, A.N. Rainbird, R.H. (1992) Nature and timing of Franklin igneous events, Canada: Implications for a Late Proterozoic mantle plume and the break-up of Laurentia, Earth Planet. Sci. Lett. 109, 117-131. Hofmann C., Courtillot, V. Féraud, G. Rochette, P. Yirgu, G. Dtefo, E. Pick R. (1997) Timing of the Ethiopian flood basalt event and implications for plume birth and global change. Nature 389, 838-841. Hofmann, C., Féraud, G., Courtillot, V. (2000) 40Ar/39Ar dating of mineral separates and whole rocks from the Western Ghats lava pile: further constraints on duration and age of the Deccan traps. Earth Planet. Sci. Lett., 180, 13-27. Jourdan, F., Féraud, G., Bertrand, H., Kampunzu, A.B., Tshoso, G., Le Gall, B., Tiercelin, J.J. & Capiez P. (2004). The Karoo triple junction questioned: evidence from 40Ar/39Ar Jurassic and Proterozoic ages and geochemistry of the Okavango dyke swarm (Botswana). Earth Planet. Sci. Lett. 222, 989-1006. Jourdan F., Féraud, G., Bertrand, H., Watkeys, M.K., Kampunzu, A.B., Le Gall, B. (2006) Basement control on dyke distribution in Large Igneous Provinces: Case study of the Karoo triple junction. Earth Planet. Sci. Lett. 241, 307-322. Jourdan F., Féraud, G., Bertrand, H., Kampunzu, A.B., Tshoso, G. & Le Gall, B. (2005) The Karoo Large Igneous Province: brevity, origin and relation with mass extinction in question from new 40Ar/39Ar age data, Geology 33, 745-748. Le Cheminant, A.N., Heaman, L.M. (1989) Mackenzie igneous events, Canada: Middle Proterozoic hotspot magmatism associated with ocean opening, Earth Planet. Sci. Lett. 96, 38-48. Le Cheminant, A.N., Heaman, L.M. (1991) U-Pb ages for the 1.27 Ga Mackenzie igneous events, Canada: Support for a plume initiation model, Program with Abstracts, Geol. Assoc. Can. 16, (A73). Le Gall B., Tshoso, G., Jourdan, F., Féraud, G., Bertrand, H., Tiercelin, J.J., Kampunzu, A.B. Modisi, M.P., Dyment, M., Maia J. (2002) 40Ar/39Ar geochronology and structural data from the giant Okavango and related mafic dyke swarms, Karoo igneous province, Botswana. Earth Planet. Sci. Lett. 202, 595-606. Le Gall, B., Tshoso, G., Dyment, J., Kampunzu, A.B., Jourdan, F., Féraud, G., Bertrand, H., Aubourg, C., Vétel V. (2005) Structure of the Okavango giant mafic dyke swarm (NE Botswana) and its significance within the Karoo large igneous province of southern Africa, J. struct. Geol. 27, 2234-2255. Marsh J.S. (2002) "The geophysical mapping of Mesozoic dyke swarms in southern Africa and their origin in the disruption of Gondwana, J. Afr. Earth Sci. 30 (2000) 499–513" : DISCUSSION. J. Af. Earth Sci. 35, 525-527. Marzoli, A., Renne, P., Piccirillo, E., Ernesto, M., Bellieni, G., De Min. A. (1999) Extensive 200-million-year-old continental flood basalts of the Central Atlantic Magmatic Province. Science 284, 616-618. Marzoli, A., Renne, P.R., Piccirillo, E.M. (2000) Ar/Ar geochronology of Mesozoic continental basaltic magmatism and the opening of the central, equatorial and southern Atlantic ocean. In: Penrose 2000: Volcanic Rifted Margins. Geology department, Royal Holloway, University of London, p. 54. May, P.R. (1971). Patterns of Triassic diabase dikes around the north Atlantic in context of predrift position of the continents. Geol. Soc. Am. Bull. 82, 1285-1292. Mège D., Korme, T. (2004) Dyke swarm emplacement in the Ethiopian Large Igneous Province: not only a matter of stress. J. Vol. Geotherm. Res. 132, 283-310. Reeves C. (2000) The geophysical mapping of Mesozoic dyke swarms in southern Africa and their origin in the disruption of Gondwana. J. Afr. Earth Sci. 30, 499-513. Schmitt, R.S., Trouw, R.A., Schmus, J.W.R., Pimentel, M.M. (2004) Late amalgamation in the central part of West Gondwana: new geochronological data and the characterization of a Cambrian collisional orogeny in the Ribeira Belt (SE Brazil). Precambrian Res. 133, 29-61. Sebai, A., Zumbo, V., Féraud, G., Bertrand, H., Hussain, A.G., Giannérini G., and Campredon, R. (1991) 40Ar/39Ar dating of alkaline and tholeiitic magmatism of Saudi Arabia related to the early red Sea rifting, Earth Planet. Sci. Lett. 104, 473-487. Tommasi A., Vauchez., A. (2001) Continental rifting parallel to ancient collisional belts: an effect of the mechanical anisotropy of the lithospheric mantle. Earth Planet. Sci. Lett. 185, 199-210. Trumbull R.B., Vietor, T., Hahne, K., Wackerle, R., Ledru, P. (2004) Aeromagnetic mapping and reconnaissance geochemistry of the Early Cretaceous Henties Bay Outjo dike swarm, Etendeka Igneous Province, Namibia. J. Afr. Earth Sci. 40, 17-29. Watkeys M.K. (2002) Development of the Lebombo rifted volcanic margin of southeast Africa. In Volcanic rifted margin, Vol. 362 (eds. M. A. Menzies, S.L. Klemperer, C.J. Ebinger, J. Baker), pp. 29-48. Geol. Soc. Am. Spec. Pap. J.F. Wilson, (1990) A craton and its cracks; some of the behaviour of the Zimbabwe Block from the late Archaean to the Mesozoic in response to horizontal movements, and the significance of some of its mafic dyke fracture patterns, J. Afr. Earth Sci. 10, 483-501. Zhao, G., Sun, M., Wilde, S.A., Li, S. (2004) A Paleo-Mesoproterozoic supercontinent: assembly, growth and breakup. Earth-Sci. Rev. 67, 1-158.